Summerlin now has a taste of Italy. The owners of Siena Deli on the valley’s east side have opened a trattoria boasting authentic dishes made from the freshest ingredients. The menu at Siena Italian Authentic Trattoria has been created by Chef Giancarlo, it includes a variety of starters, pizzas, pastas and other Italian specialties. A few months ago I shared about my love of Italian delis; Siena Deli, in particular. I mentioned how I’m unable to resist their scrumptious sandwiches and Sicilian pizza. Soon I won’t have to travel across town for these delectable treats, since there are plans to expand the Summerlin trattoria to include a full service deli. They are hopeful for an opening later this summer. In the meantime, the trattoria alone is a gem. We’ve dined twice since it opened in December. Our first visit was on Christmas Eve. We had an impromptu lunch with family. We sampled an array of pastas; everyone was pleased and service was on point. It was a wonderful surprise since they had only opened days before. My husband and I returned again last week. Despite its infancy the restaurant appears to run like a well oiled machine. The trattoria offers indoor and patio dining, a large bar, and a few grocery items and pastries are also available if you’d like to bring treats home. We dined inside; we were seated in cozy booth off the main dining room. We were brought a list of specials and the regular menu. Although a variety of wines are available we settled on iced tea. We noshed on fresh bread and a delicious olive tapenade while we looked over the menu. There is a good selection of starters and salads under ten bucks. Then, pizzas and other specialties run $9 – $19. Plus, there are a number of tempting pastas priced between $12 – $14, choices with clams and other seafood are available for a few bucks more. 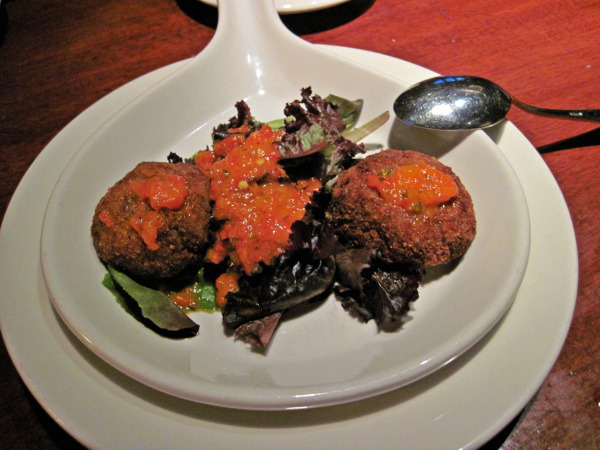 We began with an appetizer chosen from the list of specials. It was two cakes consisting of eggplant and other garden delights, lightly battered and fried, and then topped with tomato sauce ($8). It was an enjoyable starter. Next, our entrees arrived. 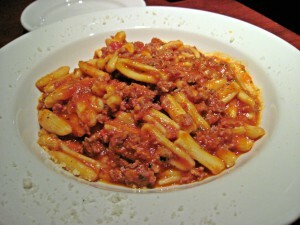 We chose two pasta dishes, Rigatoni ($14) and Cavatelli Con Salsiccia ($13). The latter is a house specialty and for good reason; it is hearty and delicious. Fresh cavatelli (pasta with a rolled edge that resembles gnocchi) is covered with a spicy sausage ragù and dusted with buttery pecorino. 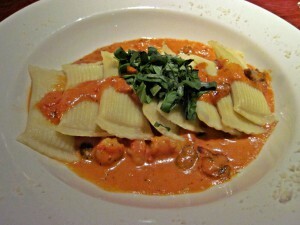 The rigatoni are pillowy bites stuffed with cheese and tossed with shrimp and mushrooms in a tomato cream brandy sauce and dressed with basil. The flavors blend to create a savory and satisfying dish. We also noted that live music Saturdays began last week. Larry Liso performs 7 pm – 11 pm he entertains with music from the Rat Pack and others favorites including Neil Diamond and Barry White. For you bargain seekers, Happy Hour is 3:30 pm to 7 pm half-price drinks and appetizers are served; although, some restrictions do apply. Thursdays are Ladies Night which honor Happy Hour specials all day. Furthermore, coupons for Siena Deli are accepted. We were able to use a coupon from the Entertainment Book on our visit. Lastly, when visiting the deli or trattoria join their email club for coupons and notifications of special events and arrivals of limited-time Italian imports. Siena Italian Authentic Trattoria is located at 9500 West Sahara Avenue Las Vegas, NV 89117. It is open Monday – Saturday 11:00 am – 10:00 pm Sunday 10:00 am – 9:00 pm.